Simple demo of ArUco augmented reality markers detection and decoding. Detect and decode patterns known as ArUco markers, which are small 2D barcodes often used in augmented reality and robotics. ArUco markers are small 2D barcodes. Each ArUco marker corresponds to a number, encoded into a small grid of black and white pixels. The ArUco decoding algorithm is capable of locating, decoding, and of estimating the pose (location and orientation in space) of any ArUco markers in the camera's field of view. ArUco markers are very useful as tags for many robotics and augmented reality applications. For example, one may place an ArUco next to a robot's charging station, an elevator button, or an object that a robot should manipulate. ArUco markers can be created with several standard dictionaries. Different dictionaries give rise to different numbers of pixels in the markers, and to different numbers of possible symbols that can be created using the dictionary. The default dictionary used by JeVois is 4x4 with 50 symbols. Other dictionaries are also supported by setting the parameter dictionary over serial port or in a config file, up to 7x7 with 1000 symbols. To make your own, for example, using another dictionary, see the documentation of the ArUco component of JeVoisBase. Some utilities are provided with the component. One message is issued for every detected ArUco, on every video frame. First, use a video viewer software on a host computer and select one of the video modes with video output over USB. Point your JeVois camera towards one of the screenshots provided with this module, or towards some ArUco markers that you find on the web or that you have printed from the collection above (note: the default dictionary is 4x4_50, see parameter dictionary). and point the camera to some markers; the camera should issue messages about all the markers it identifies. The OpenCV ArUco module can also compute the 3D location and orientation of each marker in the world when dopose is true. The requires that the camera be calibrated, see the documentation of the ArUco component in JeVoisBase. A generic calibration that is for a JeVois camera with standard lens is included in files calibration640x480.yaml, calibration352x288.yaml, etc in the jevoisbase share directory (on the MicroSD, this is in JEVOIS:/share/camera/). When doing pose estimation, you should set the markerlen parameter to the size (width) in millimeters of your actual physical markers. Knowing that size will allow the pose estimation algorithm to know where in the world your detected markers are. Definition at line 143 of file DemoArUco.C. Definition at line 149 of file DemoArUco.C. Definition at line 157 of file DemoArUco.C. Definition at line 150 of file DemoArUco.C. Definition at line 158 of file DemoArUco.C. Definition at line 163 of file DemoArUco.C. References jevois::rawimage::convertToCvGray(), jevois::RawImage::height, itsArUco, and jevois::RawImage::width. Definition at line 164 of file DemoArUco.C. Definition at line 189 of file DemoArUco.C. References jevois::rawimage::convertToCvGray(), jevois::rawimage::drawFilledRect(), jevois::RawImage::fmt, jevois::RawImage::height, itsArUco, jevois::rawimage::paste(), jevois::RawImage::require(), jevois::Timer::start(), jevois::Timer::stop(), jevois::RawImage::width, and jevois::rawimage::writeText(). Definition at line 190 of file DemoArUco.C. 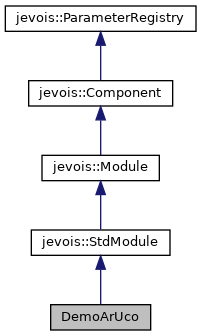 References jevois::rawimage::convertToCvGray(), jevois::rawimage::drawFilledRect(), jevois::RawImage::fmt, jevois::RawImage::height, itsArUco, JEVOIS_REGISTER_MODULE(), jevois::rawimage::paste(), jevois::RawImage::require(), jevois::Timer::start(), jevois::Timer::stop(), jevois::RawImage::width, and jevois::rawimage::writeText(). Definition at line 244 of file DemoArUco.C. Referenced by DemoArUco(), and process().